Honeybee advocates can come in all shapes and sizes—they can be celebrities, large corporations, or even just local businesses and citizens who aspire to add what they can toward a possible solution of an ongoing issue that affects us all, thanks to bees’ role in food production and agriculture. One such citizen is Maia Jaycox, a sophomore at Iowa State University who just last year was crowned “Honey Queen” by the American Beekeeping Federation (ABF) due to her beekeeping background and dedication to the ailing pollinators. As a honey queen, Jaycox took a semester off to travel the United States and talk about honeybees and beekeeping in various cities, and she spoke at her alma mater this past week to get her peers on board. Along with her father, Jaycox got into beekeeping after her mother had to give up her beekeeping endeavors due to a bee allergy. This eventually led to Jaycox working with the American Honey Queen Program after volunteering with the Iowa State Fair, testing her on beekeeping knowledge and her communication skills. As a honey queen, Jaycox is basically a public representative or salesperson for the beekeeping industry as a whole. According to the ABF, “The Queen…educate[s] the public with facts on the beekeeping and honey industry concerning pollination of our nation’s crops and how dependent we are on the honeybee for agriculture.” Jaycox says she encourages people to help honeybee populations, stating that if people can’t keep their own bees, they can support beekeepers in their area by purchasing honey. “Plant as many bee-friendly flowers as possible because they need a healthy habitat to forage on,” she said. Since she began touring in January 2017, Jaycox has visited 13 states, including her home state of Iowa. “It’s just amazing being able to travel to different places and tell them about how they can help honeybees,” she said. Jaycox has done presentations for school levels reaching from elementary to college and has also appeared at farmer’s markets and fairs, learning new beekeeping tricks and techniques as she goes. 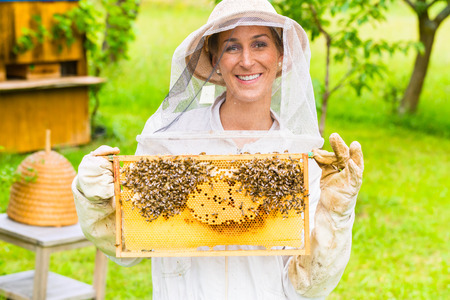 Since each state has its own beekeeping methods, this tour has been just as much of a learning experience for Jaycox as it has been for her audiences.